(Newser) – Reports surfaced last week that US special forces had captured a prominent but unidentified player in the Islamic State, and it turns out those reports weren't exaggerated. 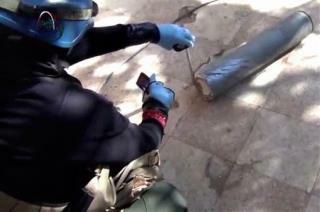 The detainee in Iraq has been identified as the head of the group's burgeoning chemical weapons unit, reports the AP. Sleiman Daoud al-Afari, thought to be about 50, previously worked in Saddam Hussein's military with the same specialty. He's been in US custody for a month now and has given up information about how ISIS converts mustard gas into powder for use in artillery shells, reports the New York Times. Evidence of such weapons has turned up in Syria and Iraq. Oh no, they have WWI technology! Hope they squeeze every bit of info out of him, any way they can, and then kill him. Don't water board, use open handed smacks, cold, or sleep deprivation on him. Only US military can volunteer to receive such treatment. Liberals call it torture. Reality calls it training.